Cable Office in Seward, Alaska, United States, is a building that served as a telegraph office that connected Seward with communications in the rest of the United States. The cable office was constructed in 1905 by the U.S. Army Signal Corps as part of the Washington–Alaska Military Cable and Telegraph System (WAMCATS). Telegraph service from the lower states first connected to Valdez, Alaska. In summer 1905, submarine cable was extended from Valdez to Seward. The first message over the line was to A. C. Frost, president of the Alaska Central Railway, who was in Chicago: 'This first message transmitted over Alaska Cable connects Seward from this day to the great city of Chicago.' Among initial regular users of the telegraph line was the local newspaper, the Seward Daily Gateway. In August 1905, owner Frank Ballaine began featuring the previous day's news from the Coterminous United States in his paper. Before the telegraph line, outside news arrived via steam ship days or weeks later. The office was operated by Army personnel. The front room of the building was open to the public who could send and receive messages. The central part of the ground floor served as the operator's station, while workers lived on the second floor. Service continued until an earthquake severed the line in 1934. By that time, radio communication had been established by the Navy and the telegraph line was not replaced. The government retained ownership until 1961. Since then, the building has served as a private residence and rented apartments. We are now offering the lower unit of this wonderful home. Completely renovated bathrooms, fresh interior paint and charming period touches throughout and a beautiful, historic exterior as well. Walking distance to the Sealife Center, dining and shopping and the waterfront. You'll love the location, the parking and the views right from your front porch! My wife and I moved to Alaska 20+ years ago and are raising four active children. We love Alaska, we love Seward. My wife and I own the home next door to this one and always hoped that one day we could purchase this historic home. 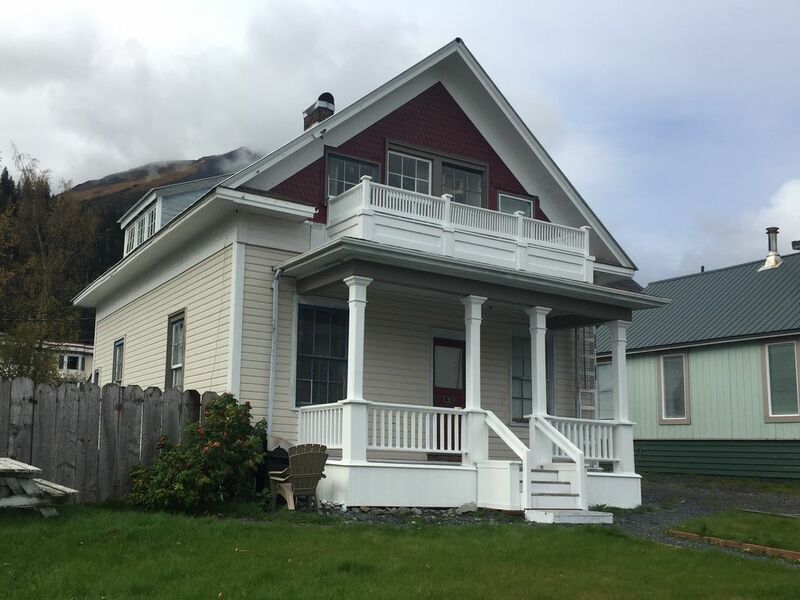 One block from the waterfront with sweeping views of Resurrection bay from the Front porch. There are additional views from the kitchen, living room and back bedroom. You can see this home in the earliest photos of Seward and we uncover new and exciting details about it's place in Seward history every day. Fully re-done bathroom in front with refinished antique tub/shower. separate toilet area. Second bathroom also new, features a tiled shower and toilet/sink area as well. Located in the heart of downtown yet quiet and peaceful. Walking distance to everything: shops, restaurants, library, , craft brewery, Sealife center, waterfront. We provide soap, conditioner and shampooo as well. Spacious, with old world charm. You can imagine the telegraph office here..
Full stocked with coffee. Tea and some basic condiments. Classic, 1940's metal cabinets. Well stocked. Historic kitchen furnishings and decor throughout. With view to Bay. Nice front porch with views to sit and enjoy dinner or a glass of wine as well. Rotation availability based on who takes and leaves what. House has a lot of interior charm. As mentioned throughout listing, we are continuing to renovate outside and always adding more amenities inside. We are experienced VRBO owners offering a National Register historic home in a fantastic location at a bargain price. House had so much history & information on its history. Everything was very clean and labeled, easy to use & find. Beds were comfortable, hosts were super accommodating & fast to respond if I had any questions. Placement of the home was perfect for our needs. We have 4 children & we rode bikes most the time. The little house fit all 6 of us comfortably. And had all the basic necessities we needed. 5 stars, loved it, will totally rent again. Nice to have space for two couples. Cable house is well equipped with all the comforts of Grandmas house. Nice view and close to downtown. Pretty antiques but appreciate modern bathroom with a good hot shower. Quick response for our request for WiFi password. We would stay there again. Thank you for your kind words about our home. We take great care to honor the heritage of this National Register Property and are delighted when our guests appreciate the antiques and special touches of our 100+ year old Seward landmark. Comfortable and charming - fabulous location. My son, daughter-in-law and young grandson and I enjoyed the comfort and convenient location of the Cable House. My grandson and I especially loved our walks along the water and to the playground near by. We all also enjoyed walking to shopping and restaurants. The house was very well appointed, the kitchen well equiped for cooking and the antique-themed decor was charming. This historic home has lots of character but still needs work. The bed was really comfy & the kitchen is well stocked. The bathroom needs a smaller mirror so a shelf can be placed under it as there is absolutely nowhere to put a dop bag, toothbrush, etc. The bedroom with the larger bed needs a nightstand with a lamp for people to put glasses & books. (Luckily I had my Kindle so I didn’t have to have the pole light turned on). The photo of the house is misleading as the house is divided into an apartment on the lower floor and one on the upper floor: when renting you are not renting the entire house. The owner is friendly and helpful, the location was ideal for us and we appreciated having a large fan available for white noise. It would have been nice to have a small stacked washer dryer available & although we took short showers, we ran out of hot water every night (and there were only two of us!!). The house was clean and the towels were fluffy and wonderful. However, the sheets were awful microfiber sheets and if I had had time, I would have purchased more comfortable cotton sheets. Enjoyed our stay in the Cable House. Steps from Resurrection Bay and downtown. House has been renovated but retains historic charm thanks to the period wall art and decor. Caretaker is responsive and friendly. Comfortable -- would stay again. Thanks! Central location you can walk anywhere, quiet neighborhood, house is 100 years old but owner has made significant improvements to where it is comfortable but still has it's historic charm. Walking distance to Sealife center, waterfront, playground, shops, dining, many activities. Great downtown location on a quiet street. AK Railroad and marina are close by.